Jim graduated from the Ohio State University College of Law in 1973, and was admitted to practice the same year. He joined the firm in 1976 after serving two years as Athens City Prosecutor. Jim is admitted to practice before all Ohio courts and agencies. He is also admitted to practice before the United States District Court for the Southern District of Ohio, the United States Court of Appeals for the Sixth Circuit, and the Supreme Court of the United States. 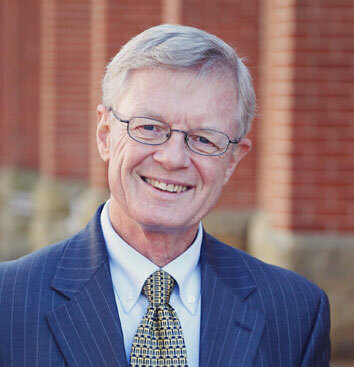 Jim is a member of the Athens County Bar Association, which he served as President in 1981. He is also a member of the Ohio State Bar Association. Jim served on the Board of Governors of the Ohio State Bar Association from 2010 to 2013. He was chairman of the Ohio State Bar Association’s Government Affairs Committee from 2012 to 2013. For ten years, Jim served on the Athens Zoning Board of Appeals. He is currently a member of the Athens Crime Solvers Anonymous Board, which he has served as President for over twenty-five years, and previously served on the City Recreation Advisory Board. Jim is past President of the Southeastern Ohio Food Bank Advisory Board.